“The Frontier Works Organization (FWO) has built roads with 502 kilometers length on the western alignment of China Pakistan Economic Corridor (CPEC) to link Gwadar with other parts of the country. The FWO took up the challenge to extend the benefits of Gwadar port to rest of the country by building roads in rugged mountainous terrain and highly inaccessible areas. The gigantic task was undertaken on the directives of Chief of Army Staff General Raheel Sharif." 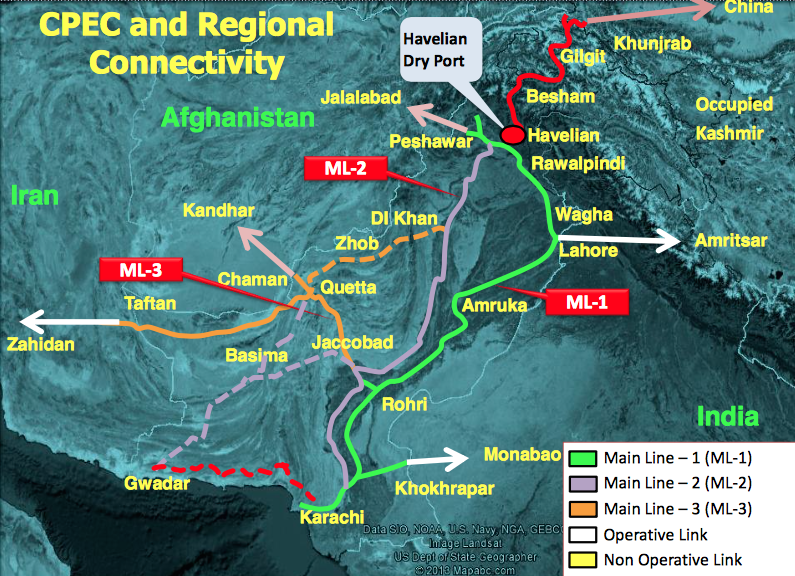 Of the three land routes being constructed as part of the China-Pakistan Economic Corridor (CPEC) project to connect Pakistan's deep sea Gwadar Port on the Arabian Sea with western China, the western route is the most challenging. In addition to the difficult mountainous terrain in KP and Baluchistan provinces, the western route runs through Panjgur and Turbat where there is an active Baloch insurgency believed to be aided by India via Afghanistan. It's being built by Pakistan Army's Frontier Works Organization. Frontier Works Organization (FWO) is an administrative branch of the Pakistan Army that includes active duty officers and civilian scientists and engineers which has been involved with the construction of bridges, roads, tunnels, airfields and dams in Pakistan, on the orders of the civilian government of Pakistan, according a Reuters report. The completion of construction of 502 km of the 870 km length of the western alignment represents a significant milestone for Pakistan Army and the Frontier Works Organization. It is expected to become operational by the end of 2016. India has made no secret of its strong opposition to the the CPEC project, and it is believed to be making covert efforts to sabotage it. Indian Foreign Minister Sushma Swaraj has said that Indian Prime Minister Narendra Modi “very strongly” raised the issue regarding China-Pakistan Economic Corridor (CPEC) during his visit to Beijing, and called the project “unacceptable”. Swaraj said Modi was “concerned” about the $46 billion project, adding that the Indian government had summoned a Chinese envoy to raise the issue over the corridor that is to run through Pakistani Kashmir. Needless to say that the Chinese dismissed India’s objections to the China-Pakistan Economic Corridor (CPEC). In spite of Indian RAW's most determined effort to support the Baloch militants' campaign of murder and terror, the Baloch insurgency has been significantly weakened by the Pakistan Army campaign in the province. In 2013 earthquake that struck Awaran, a stronghold of Baloch insurgents, Pakistan Army moved in with relief supplies to earthquake victims, and managed to gain access to parts of the very volatile district that were considered inaccessible. More recently, the insurgency has been decimated by in-fighting among various Baloch insurgent factions. The 2014 death of veteran Baloch leader Khair Bux Marri has opened up a rift between his sons Mehran and Hyrbyair — who heads the BLA from self-exile in London — and led to the creation of the UBA with other groups also aligning themselves with one side or the other. Pakistan Army Chief Raheel Sharif has shown a strong personal commitment to making it happen by visiting insurgency-hit areas to support the workers and the troops on difficult construction sites. He was emphatic during a ceremony to celebrate the Chinese Army’s 88th anniversary held at the country’s Islamabad embassy where he said, “I reiterate our resolve that any attempt to obstruct or impede this (CPEC) project will be thwarted at all costs". Construction work on CPEC is already stimulating economic activity in Pakistan as indicated by rising domestic cement demand in the country. It was up 8% year over year in 2014-15. Cement sales are considered a barometer of development activity. A recent assessment by Ruchir Sharma, head of Morgan Stanley's emerging markets, has said Pakistan's economy is growing more than twice as fast as emerging markets other than India and China. In a piece titled "Bucking stagnation elsewhere, the quiet rise of South Asia", Sharma particularly mentions the Chinese CPEC investment of $46 billion as a positive for Pakistan. "Pakistan’s manufacturing sector is now growing, due to both increasing electric output and the fact that – like Bangladesh – its young population and labour force is expected to continue expanding for at least the next five years", says Sharma. Pragmatic decisions by the Pakistani government will change the country’s fate, bring political stability and give a fillip to the economy. This was said by Daniel F Runde of the Centre for Strategic and International Studies (CSIS) at a seminar organised by National University of Science and Technology (Nust) on Monday. The event was organised by the university’s global think tank network (GTTN) in collaboration with the CSIS, said a press release. “Pakistan has all necessary ingredients to be the next Colombia or Indonesia,” said the development expert. Runde pointed out that Pakistan is a significant South Asian country with massive urbanisation trends and 60 per cent population under 30 years of age, which is a healthy indicator of demographic productivity. The Pakistani diaspora in the US must also be mobilised in order to optimise their presence in the US and strengthen Pakistan’s image as an emerging country, he added. NUST adviser and GTTN President Amer Hasmi said sustainable economic development was crucial for Pakistan’s rise. He emphasised the need of innovation-based higher learning in Pakistan and explained the university’s contribution through its knowledge ecosystem. He highlighted GTTN’s goals and efforts in furnishing viable policy options for issues of national, regional and global importance. He apprised the audience that the Nust national science and technology park had won the official candidacy for hosting the 34th International Association of Science Parks’ 2017 World Conference on Innovation in Islamabad. He urged all friends of Pakistan to help the university win the event which has full potential to be a game-changer for the country’s development itinerary. The CSIS delegation considered China-Pakistan Economic Corridor as a watershed opportunity and a turning point for Pakistan, adding that the American investors are also interested to tap into the Pakistani market. Some of the Pakistani participants, however, took this optimism with a pinch of salt. There was a view that the issues of accountability, performance and governance should be resolved, if Pakistan was to progress in substantive terms. The event marked a productive discourse on fall-out of current geopolitics, its implications for Pakistan and the region at large, and a pragmatic approach to manage challenges. The participants achieved a general consensus of resolving Pakistan’s critical indigenous issues through self-reliance and efficient governance, performance and accountability. Several former diplomats and bureaucrats, along with academics, researchers and students attended the event. Energy is a critical element in our lives and positive developments are taking place in energy sector of Pakistan. Four to five years from now, our country will have a significant energy growth as many big projects are in the pipeline, said Syed Asad Ali Shah, former advisor finance, Sindh, on Tuesday. “One of the greatest achievements of this government is to import LNG through LNG terminals, which have been completed laying down in March this year. LNG import is becoming streamlined. It will very much help redress energy crisis,” he said while speaking as a guest of honor in Conference on Entrepreneurial Engineering Opportunities in Renewable Energy for Self Sufficiency organized by College of Engineering Sciences, Institute of Business Management (IoBM). He said apart from achievement in LNG sector, oil prices had also crashed which would boost overall production of the country. Shah said integration in energy sector was a much needed. All the companies working in silo should be controlled and monitored by one single body. “It is unfortunate thing that our country has been relying on imported fuel to generate electricity, while, our country is blessed with many resources and one of them is huge reserves of coal. I see positive development in Thar coal as Engro Corporation and Habib Bank Limited will be working on it,” he said. He said hopefully, sanctions on Iran would be soon lifted and Iran-Pakistan (IP) Gas project would become reality. Prime minister of Pakistan has also discussed energy issue with Turkmenistan in his recent visit. We are generating 100mw electricity from wind corridors, which have the capacity of thousands mega watt. We also have great potential of solar energy if used properly,” he said. Chief Executive Officer (CEO) Engro Vopak Terminal Limited Shaikh Imran Ul Haq delivered presentation on how Pakistan got LNG pipeline laid. How challenging it was in 335 days, “still Engro achieved this task”.“We are energy deficit country and importing LNG will provide us cheap alternative energy,” he said. Senior Executive Director Osmani & Co Dr Akhtar said Europe and America had excelled in wind and PV solar energy as renewable energy, while coal, gas and oil are vanishing in those countries. Germany’s single largest energy production is solar and we were not getting benefit of this natural resource despite abundance of it in our country. He said wind and PV solar energy should be used by choice rather than compulsion. Karachi was going to be dark in the smoke of pollution and electric vehicles were the solution for this. Managing Director Systek (Pvt) Ltd Navid Ansari said energy gap is third world countries like Pakistan could not be overcome in near future. Solar energy could be immediate, affordable and abundant alternative source. Planning, Development & Reforms, Syed Akhtar Ali said pricing on PV solar products should be lowered to promote the product. The government needed to lower duties on local production to make it viable. Rector IoBM Talib Karim, Chairperson IEEE Dr Parkash Lohana, Ex-managing director Siemens Sohail Wajahat, Engineer, IEEEP, Irfan Ahmed,Dean Faculty of EECE MUET Dr Bhawani Shankar and HoD Public Affairs and Senior faculty IoBM Parvez Jamil were also present on the occasion. The IMF on Friday forecast Pakistan’s country’s economy to increase to 4.5 per cent this fiscal, citing macroeconomic stability, low global oil prices, planned improvements in the domestic energy supply and investment related to the China-Pak Economic Corridor. “Pakistan’s economy continues to improve,” said Harald Finger of the Washington DC-based International Monetary Fund (IMF) at the conclusion of the IMF’s country review in Dubai from July 29-August 7. Finger led the IMF delegation while the Pakistani team was led by its Finance Minister Ishaq Dar and State Bank of Pakistan (SBP) Governor Ashraf Wathra. “Real GDP growth is expected to increase to 4.5 per cent this fiscal year, helped by macroeconomic stability, low oil prices, planned improvements in the domestic energy supply, and investment related to the China-Pakistan Economic Corridor,” Finger said. “Inflation dropped to 1.8 per cent in July, but is expected to increase in the coming months with the anticipated stabilisation of commodity prices,” he said. He added that despite declining exports, the external current account deficit narrowed to 0.8 per cent of GDP in the financial year 2014-15 owing to favourable oil prices and strong growth of remittances. Following the country review, IMF and Pakistan reached an agreement on disbursement of another USD 502 million in financial assistance to Pakistan. In a statement, IMF welcomed Pakistan’s plan to continue strengthening public finances and external reserve buffers, and to accelerate efforts to widen the tax net to create space for infrastructure investment and social assistance. In addition, efforts continue to restructure loss-making public enterprises, including through strategic partnerships with the private sector, advance the energy sector reform, improve the business climate, and further expand coverage under Benazir Income Support Programme (BISP) to protect the most vulnerable, Finger said. Pakistan is set for continued strong economic growth, the IMF said, forecasting that GDP will increase by 4.5% this fiscal year, which runs from July to June. Growth has been “helped by macroeconomic stability, low oil prices, planned improvements in the domestic energy supply, and investment related to the China-Pakistan Economic Corridor,” the IMF noted. The country’s inflation rate dropped to 1.8% in July, but is expected to rise in coming months, if commodity prices stabilize, as expected, the IMF said. The organization also noted that Pakistan narrowly missed some budget deficit, tax revenue and government borrowing targets recently. Foreign exchange reserves at the state bank rose at a healthy pace, the IMF added, reaching $13.5 billion at the end of June. China has asked Pakistan to establish industrial parks/special economic zones in those areas where provisions of all basic necessities are available such as steel, cement, automobiles, construction materials, household appliances, textile, light industries, garments and others. 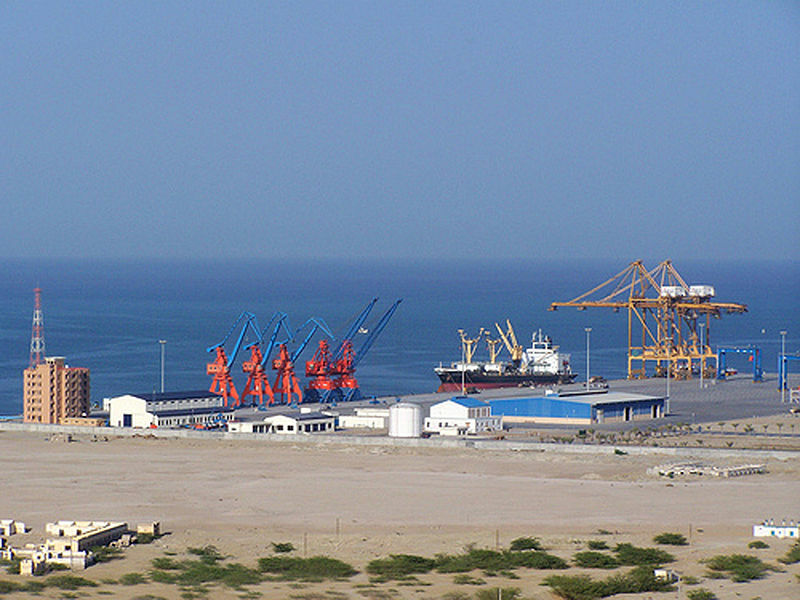 Beijing has also conveyed to Islamabad on Monday that they will like to develop Gwadar area as first priority and they will start cooperation from the key projects such as Gwadar Port Free Zone and Haier-Ruba Industrial Park-II, an official presentation titled "CPEC-progress review" reveals, a copy of which is exclusively available with The News. 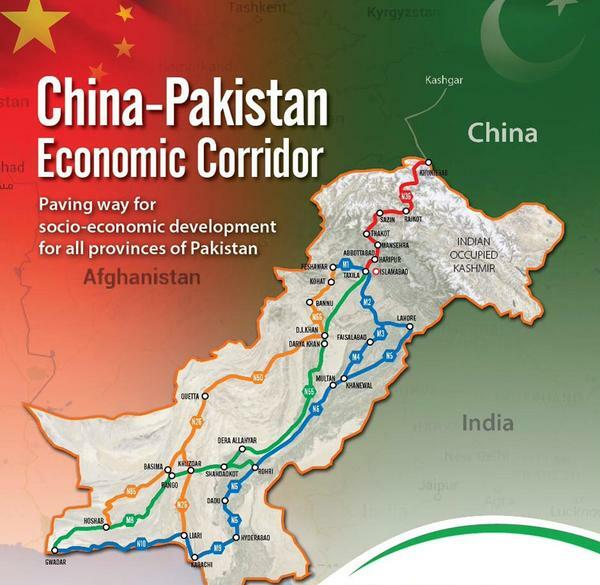 On China-Pakistan Economic Corridor (CPEC) worth $44.413 billion, Pakistan's military and civilian political leaderships including ruling and opposition parties seem on one page, giving strength to this idea that projects under CPEC would be completed at all costs irrespective of any political divide that may exist in this country. "At the preliminary stage, we could start from the key projects such as Gwadar Port Free Zone and Haier-Ruba Industrial Park-II," the Chinese side has set the tone for undertaking cooperation under much hyped cooperation between the two countries. The Chinese side, on proposed industrial parks and special economic zones (SEZs) under CPEC, responded that there was need to conduct industrial and investment cooperation in such areas where provision of steel, cement, automobiles, construction materials, household appliances, textile, light industries, garments and others are available in rampant in order to meet requirements of mass scale industrialisation. The Chinese further advised Pakistani side to give full play to the Secretariat or the working group on overall planning to explore cooperation on investment and industrial park at the current stage. Beijing viewed that the set-up of new working group could be taken into consideration in due time when the stage would be set for enhancing cooperation between the two sides. Pakistani side decided to finalise industrial parks/SEZs in consultation with the provinces. The federal government had proposed 29 industrial parks and 21 special economic zones at different sites of the provinces but it would be finalised after taking the federating units into full confidence. Meanwhile, the CPEC International Forum is being arranged today (Tuesday) at Karamay, Xinjiang China on August 11 and 12, 2015 and Federal Minister for Planning, Development and Reforms Professor Ehsan Iqbal is leading Pakistani delegation. This conference will be participated by Pakistanis and Chinese authorities, think tanks, local and corporate delegates. It is the goal of the conference to specify principles and goals for implementation of CPEC. This conference is expected to lead towards establishment of permanent international forum. Both the countries have also decided to initiate and promote China-Pakistan cooperation projects including people-to-people contacts and match- making amongst enterprises, the official presentation concluded. In Pakistan’s Portion it will start at the point of Khunjrab Top near Pak-China border. It then will travel toward city of Gilgit (Head Quarter of Gilgit Baltistan). After Crossing Chilas and Kohistan it will reach Dasu and Then Besham (District Shangla). Traveling beside Indus River it will reach at Thakot, Where it will goodbye Great Abaseen for some a movement and will entered in Batgram. After this, CPEC will reach Mansehra and then in Abbottabad (Hazara Region, an Hindko spoken areas). Then it will leave Khyber pakhtunkhwa province for a while and will enter in Punjab province. At Hassan Abdal (District Attock) it will enter in Punjab. At Hassan Abdal Korakoram Highway and G.T. Road meets. It will the reach Balkasar and then Reach Mianwali. Again it will cross Indus River near D.I. Khan in KPK Province. Then it will Enter in Balochistan province leaving behind the Khyber Pakhtunkhwa. Its first city in Balochistan will be Zhob and then Qila Saifullah. It will then reach Quetta (Head Quarter of Baluchistan Province). This historical Road network will then travel through Mastung, Kalat, Surab, Besima, Panjgur and Turbat. The Final destination will be International Sea Port, The Gwadar. Estimated Length of This Western Alignment (From Khunjrab to Gwadar is 2650 Kilometers. On August 11 and 12, a forum on the China-Pakistan Economic Corridor (CPEC) convened in Xinjiang, in northwestern China. According to Xinhua, the event was attended by “[m]ore than 300 officials and delegates from companies, think tanks and social organizations” from both China and Pakistan. Under the CPEC, China and Pakistan plan to build infrastructure to connect Gwadar Port in Pakistan with Kashgar in Xinjiang. The project has become a “flagship project” of China’s Silk Road Economic Belt, although it was proposed in May 2013, a few months earlier than the broader economic belt. As a sign of its important place in the overall strategy, the CPEC was the first project to receive an investment from China’s $40 billion Silk Road Fund, providing partial financing for the $1.65 billion Karot hydropower project in Pakistan. Pakistani President Mamnoon Hussain predicted that the CPEC will be “a monument of the century” during his February 2014 visit to China. The forum in Xinjiang this week ended with the issuing of the “Karamay Manifesto” on the CPEC, which “praised the significance of the Belt and Road Initiative and 21st Century Maritime Silk Road initiative for the political trust, economic cooperation and cultural exchanges of the countries along the road,” according to Xinhua. 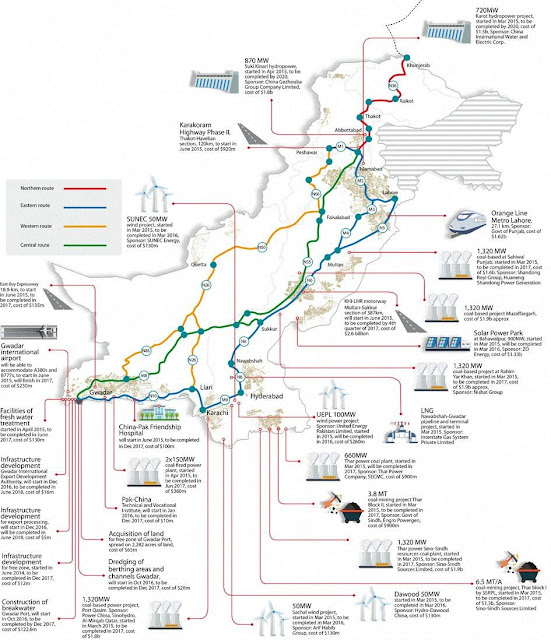 For Pakistan, the project represents an economic boost and a potential solution to an ongoing energy crisis. 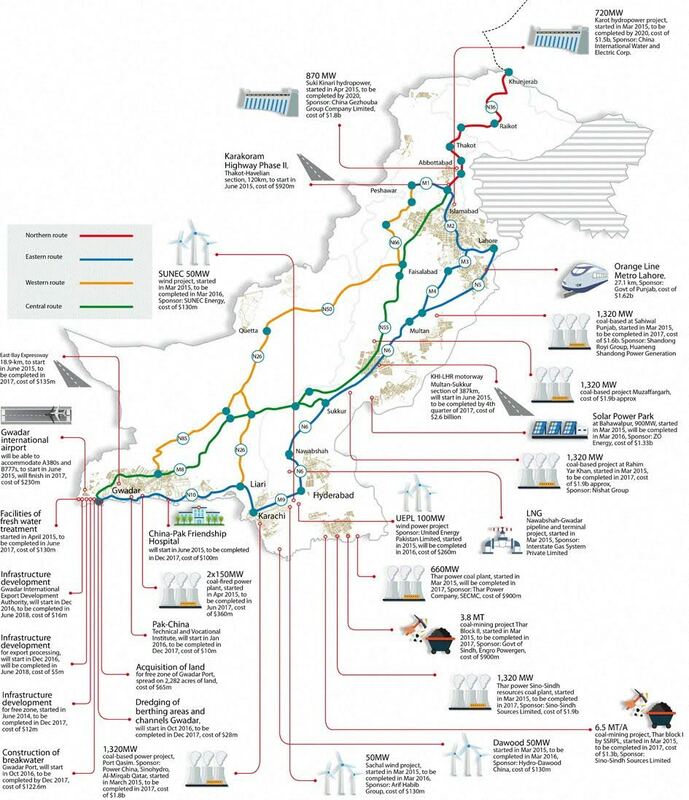 According to China Daily, “gas, coal and solar energy projects” — planned under the CPEC framework have the potential to double Pakistan’s current capacity. For China, meanwhile, the project is a must if the broader Silk Road Economic Belt, with its attendant benefits for China’s domestic economy, geopolitical clout, and regional stability, is to get off the ground. Pakistan, China’s “iron brother,” will likely be Beijing’s most eager partner along the planned Silk Road. China also sees the CPEC in particular as a way to diversify its energy supply, lessening reliance on easily disrupted maritime trade routes. Other analysts, however, point to the difficulties still facing the CPEC. For one thing, there are lingering security concerns, given unrest and insurgencies in Balochistan, the province where Gwadar is located. There are also domestic arguments in Pakistan over the exact route of the CPEC, which will determine which provinces and cities will reap the windfall of Chinese investment. Indeed, China and Pakistan seem to be making even more ambitious plans for the CPEC, including links to Iran. Since Iran and the P5+1 negotiating parties reached an agreement to lift economic sanctions in exchange for limits on Tehran’s nuclear program, Iran is once again open for business to the world. Neighboring Pakistan is one of many countries seeking to boost economic ties with Iran – and according to a report in The Express Tribune, many of the Pakistan-Iran links under discussion will be tied to the broader CPEC. China Pakistan Economic Corridor will be of immense benefit for both the countries. Gwadar, owing to ideal location of its deep Sea Port, is expected to develop into a regional hub, serving the incoming, outgoing commercial traffic, and also facilitating in transit and intra-transit trade from many countries. Once the connection between Gwadar Port and Kashgar through the Indus and the Karakoram Highway materialises, it will serve Pakistan and China's economic interests as well. Hashoo Group, realising very early the importance of Gwadar, and keeping the interests of our country at the foremost, the group has invested over Rs 2 billion including construction of 5-star hotel in the region by the name of Zaver Pearl Continental Gwadar to cater to the needs of its customers who are mostly government officials, foreigners, businessmen, bankers, tourists etc. Located on the cliff-top of the Koh-e-Batil in the beautiful surroundings of Arabian Sea and clear beaches, the hotel has 114 bedrooms equipped with modern facilities, three restaurants offering variety of cuisines, coffee shop, banquet facilities, health club and SPA, 24 hours business centre, and car rental facilities available for both in-house and walk in clients. Further, given the scenic attraction of Gwadar with its long stretch of golden sunny beaches, it is soon expected to become a tourist resort for tourists. The Makran coastal highway has linked Gwadar with Karachi, which has improved access to the hotel. In a major step towards the execution of infrastructure projects under the China-Pakistan Economic Corridor, Pakistan on Wednesday approved the awarding of contracts for the construction of two eastern alignment schemes to Chinese firms. The Economic Coordination Committee (ECC) of the Cabinet decided to grant the contracts for engineering design, procurements and construction to execute the 392-kilometre Multan-Sukkur section of the Lahore-Karachi motorway and the 120km long Thakot-Havelian section of Karakoram Highyway-II (KKH-II). Since China is providing concessionary loans for both the projects, the contracts will be awarded in government-to-government mode, waiving the condition of international competitive bidding. However, there will still be a competition among Chinese state-owned companies and Beijing has forwarded a set of three names for each of the project. The ECC, while approving the award of the contracts to Chinese firms, noted that the mechanism for such projects was already covered under article-II of the framework agreement signed by Pakistan and China in April, according to an official handout. For implementation of the Rs95.4 billion KKH-II Thakot- Havelian section, China has forwarded the names of China Construction Company, China State Construction Engineering Company and China Civil Engineering Construction Corporation, according to National Highway Authority (NHA) officials. The NHA has been mandated to execute these projects and Rs20.5 billion from the current fiscal year’s budget have been allocated for this purpose. For the Rs259.4 billion Multan-Sukkur section of Lahore-Karachi Motorway, Beijing forwarded the names of China Construction Company, China Civil Engineering Construction Corporation and Syno Hydro Company, said the officials. Rs50 billion have been earmarked for this project in the current fiscal year. The winning firms will be picked up by end of this month, said the officials. They added the financial agreement with China Export-Import Bank will be signed by October and the firms will be mobilised to commence the construction work in the same month. The ECC on Wednesday also approved the issuance of sovereign guarantees by the finance ministry in respect of syndicated term finance facility amounting to Rs7.5 billion for the power sector. The amount has been obtained for reducing the circular debt, which jumped to over Rs600 billion including Rs325 billion that the government has parked in a holding company. The committee, meanwhile, deferred the approval of the automobile policy amid transparency concerns. Finance Minister Ishaq Dar directed the industries ministry to place the policy on its website and accommodate changes recommended by people. ECC also extended the deadline for export of surplus wheat from Punjab and Sindh to September 30, 2015. It also approved the exemption of 5% sales tax on wheat bran.